This page last revised June 29, 2015. 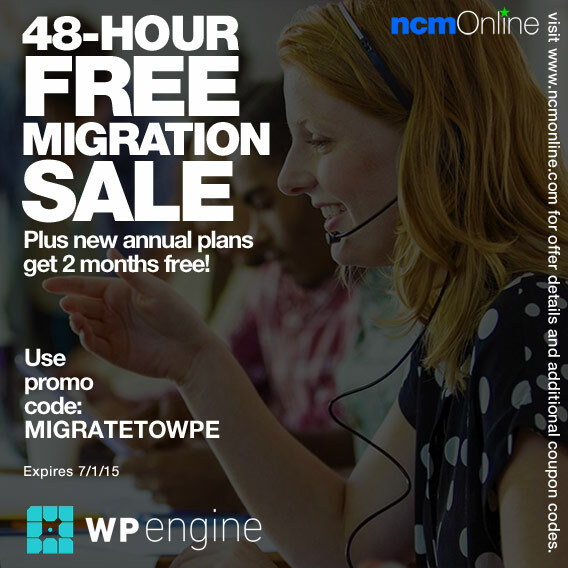 WP Engine Automated Migration plugin for FREE with the 48-hour special offer code. Use promo code MIGRATETOWPE in your cart when you order. WP Engine has introduced the WP Engine Automated Migration, a new plugin that reduces the time it takes to fully migrate a site to their WordPress hosting platform. If you’ve ever migrated a site, you know it is difficult, time-consuming, and often expensive. With the WP Engine Automated Migration plugin, they’ve taken the hassle out of the equation. Validity: Offer valid for new customers only; does not apply to upgrades or existing customers. Customer must purchase an annual Personal, Professional, or Business plan. Cannot be combined with other offers.